Anderson Cleaners offers complete wedding gown service from restoration to heirloom packaging. Bring your precious memories back to life with our exclusive service. If you have a yellowed wedding dress, Anderson Cleaners will restore the dress to like-new condition using an exclusive whitening process. All gowns are cleaned individually, NEVER with any other garments. We personally services all the wedding gowns, with gentle care that will preserve and protect your precious gown. Decorative beading and appliqué needs to be sewn, not glued. Avoid leaving the dress on a hanger, which can ruin the shape. Never store in plastic, this causes yellowing. Plastic is for transporting only. 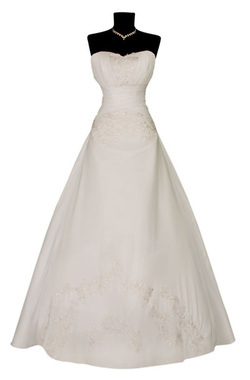 Have gown cleaned as soon as possible to prevent damage, stains set with age. After preservation, store in a cool dry place, without extreme temperature changes. Every 3-5 years, refold boxed dress to prevent permanent wrinkles. Our heirloom packaging process, following museum-quality standards, preserves your wedding gown for future generations. Upon completion of cleaning of wedding gown, it is carefully hand folded with acid-free tissue distributed between the layers. All of our packaging includes acid-free paper, muslin, and acid-free boxes. In conjunction with recommendations from the Smithsonian Institute in Washington DC, we do not seal our preservation box, and advocate that the consumer look at the gown periodically. The wedding storage box is encased in a cardboard box for double protection. Other items available for heirloom preserved are Christening gowns, Communion dresses, doll clothes, and clothing that you want to preserve for future generations. Estimate can be quoted from a description of the dress, including length, train or no train, fiber content, trim and beading, hem soil and staining. Email or call us for an estimate, or further information. We can provide this service﻿ via mail order. Accepting worldwide mail orders. Send your fine garments for dry cleaning or specialty stain removal to our experienced staff. We recommend UPS or US Post Office and be sure to insure your garment.